Large Antique 1930's French Blue Cameo Art Glass Vase W Race Horse Signed. 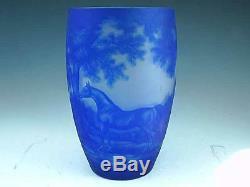 For sale is this Large Antique 1930's French Blue Cameo Art Glass Vase With Race Horse. It signed by the maker but I have not figured out what company is was. It came out of a local collection and the lady that owned it said her grandmother bought it 1930's. It is very heavy beautiful glass. The vase weighs around 7 or 8 pounds. It is 12 1/4" tall and 7 1/2" in diameter. The vase is in excellent condition. Rings like a bell when tapped. If there is a reason you need longer just let us know. In case of very expensive item insuance may be added to your invoice. Please wait for us to send you an invoice. All items are acquired from estates and estate sales around New England. All items are pre-owned and may have normal wear associated with the age of the items. We strive to bring attention to all defects and damage. All weights and measurments are approx. Clovercroft Antiques was established in 1985. Specializing in flow blue and Staffordshire as well as a line of general antiques of all kinds. We scour New England looking for new items to offer. Please feel free to ask questions. We will do our best to answer all questions within 24 hours. We are on the road allot so occasionally it may be longer but we will get back to you. Your questions are improtant to us. Get Supersized Images & Free Image Hosting. Create your brand with Auctiva's. Attention Sellers - Get Templates Image Hosting, Scheduling at Auctiva. Auctiva offers Free Image Hosting and Editing. The item "Large Antique 1930's French Blue Cameo Art Glass Vase W Race Horse Signed" is in sale since Tuesday, August 28, 2018. This item is in the category "Antiques\Decorative Arts\Glass\Vases". The seller is "crashfb" and is located in Nobleboro, Maine. This item can be shipped to United States, Canada, United Kingdom, Denmark, Romania, Slovakia, Bulgaria, Czech republic, Finland, Hungary, Latvia, Lithuania, Malta, Estonia, Australia, Greece, Portugal, Cyprus, Slovenia, Japan, Sweden, South Korea, Indonesia, Taiwan, South africa, Belgium, France, Hong Kong, Ireland, Netherlands, Poland, Spain, Italy, Germany, Austria, Israel, Mexico, New Zealand, Singapore, Switzerland, Norway, Saudi arabia, Ukraine, United arab emirates, Qatar, Kuwait, Bahrain, Croatia, Malaysia, Brazil, Chile, Colombia, Costa rica, Panama, Trinidad and tobago, Guatemala, Honduras, Jamaica, Barbados, Bangladesh, Bermuda, Brunei darussalam, Bolivia, Ecuador, Egypt, French guiana, Guernsey, Gibraltar, Guadeloupe, Iceland, Jersey, Jordan, Cambodia, Cayman islands, Liechtenstein, Sri lanka, Luxembourg, Monaco, Macao, Martinique, Maldives, Nicaragua, Oman, Peru, Pakistan, Paraguay, Reunion, Bahamas, Viet nam.